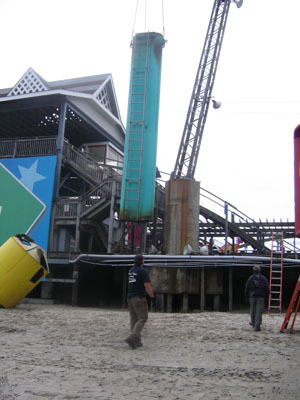 Over the last two weeks the Wildwood Boardwalk has lost two very distinctive landmarks. 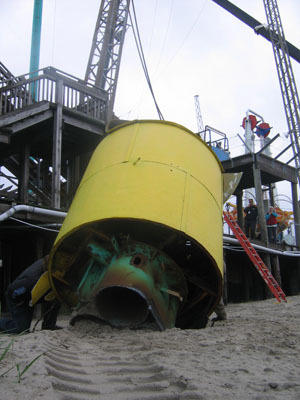 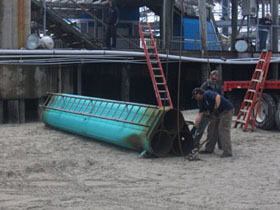 The first being the beloved Golden Nugget Mine Ride on the old Hunt's Pier, which after months of dissection was finally brought down on April 20th, 2009. 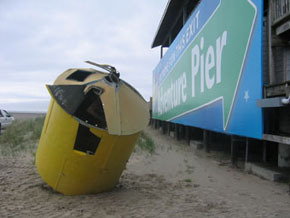 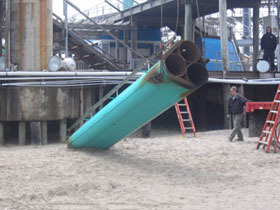 The second was a structure that loomed over the old Fun Pier since the mid-1960's. 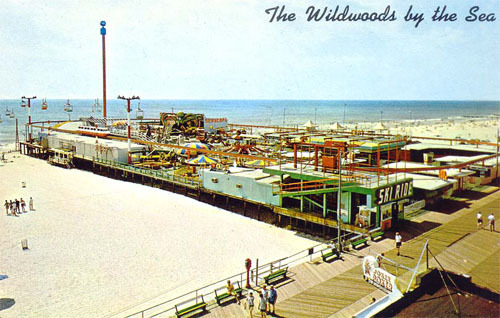 No doubt younger vacationers hadn't a clue what this tower was or what purpose it once served, but for myself and other baby boomers... we remember it well. 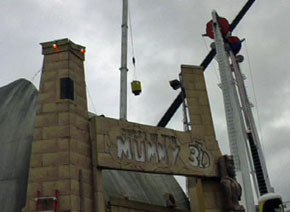 Many years have slipped by since this attraction was intact and fully functional - in fact, it sadly remained dormant for the majority of its existence. 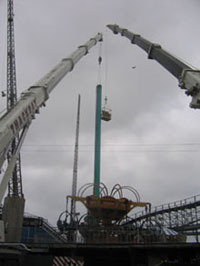 On Tuesday, May 6th 2009, I said goodbye to the old familiar tower that has been the silent sentinel on Fun Pier for more than 40 years. 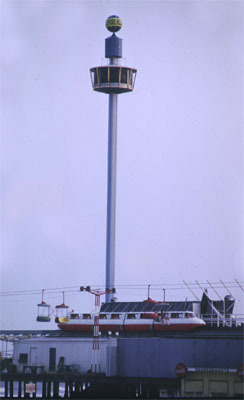 The Sky Towers lighted gondola (which could carry up to 30 passengers) would slowly rotate continuously throughout the ride, providing a panoramic view of the island. 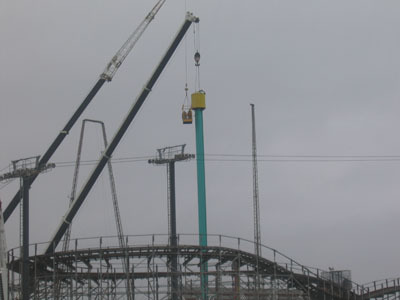 In its early years of operation it was said to have attracted 8 to 10,000 riders a week. 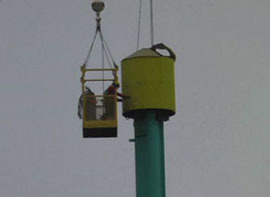 It began (where else) but at the top, with the removal of the cupola. 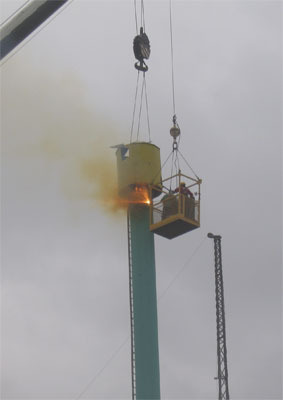 Bernard of American Demolition Company skillfully torch cut through the steel tower for the first phase. 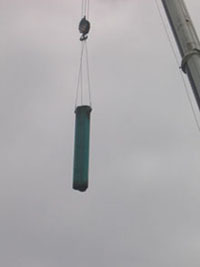 The second section of tower was approximately 20 ft in length. 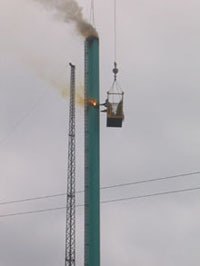 The torching created a spooky smokestack effect conjuring up dreadful images in my mind.